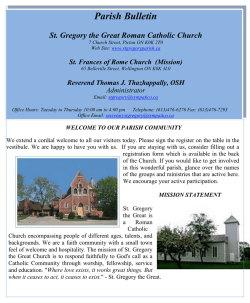 “ONE FAMILY - SHARING GIFTS - SERVING CHRIST” TO ALL WELCOME! 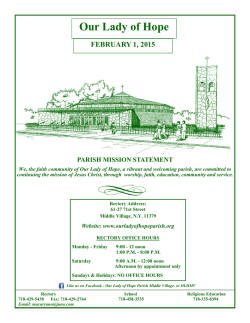 We welcome our parishioners and visitors to our weekend celebra ons. Our Lady Help of Chris ans is a faith community in the Brentwood area of Abington, PA.
We are a family united in God’s love and in service to one another. business hours to make an appointment. family: spiritually, socially and financially. Our Church was dedicated in 1963.
and visitors. We thank you for your generosity! Bap sms may be scheduled for the 2nd and 4th Sunday of the month. oﬀered by appointment with Father Janton or Deacon Rooney. Na onal Holidays & Sundays. six months prior to the wedding date to make arrangements. 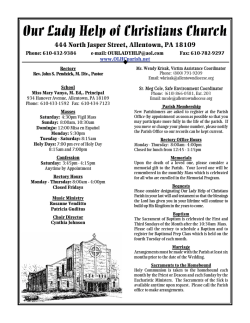 for your continued support to our Church. your support to this important endeavor. Francis Sherwinski, Nina Pham, John Meiszner, Sgt. Entrance: #375 "Gather us Together"
Gift Preparation: #475 "Open my Eyes"
Recessional: #479 "Lead me Lord"
teaching with an authority that makes people marvel. information to the rectory office as soon as possible. 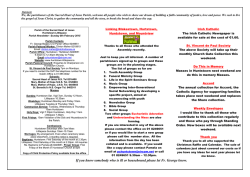 meetings on Friday, March 13, 2015 at 11:30 a.m. There will be no meetings during January and February. Sat. March 21 - Wedding Anniversary Mass 5 Vigil. pm; Pot Luck Dinner to follow. will be available for pickup at next weekend's Masses. Steubenville Youth Conference this summer. April - 50% off china and metal ware - May clothing bag sale. Nights will be held on Thurs. Feb. 26th and Thurs. grieve your loss; and forgive yourself and others. in Frazer, PA. Please call for more information (215) 9066337 or (610) 399-0890. All contacts are confidential. a child preparing to enter Kindergarten in September? answered, and bring your child for a story time/craft. held on Sat. March 21st after the 5PM Mass. "Dad needed surgery and we knew he would need rehab. pleased. Thank you Brookdide." Mary P.
facility in the heart of Roslyn, PA.
Open your Home, your Heart, your Horizon! • Receive a monthly stipend. to members. New members welcomed.